All Glastar grinders are completely manufactured in the USA. The Glastar Bevel Star is a Special Order item. When you click the "Add to Cart" button, we will special order the machine for you. Allow 10-14 days for delivery. Price includes free shipping to addresses in the Lower 48 States. 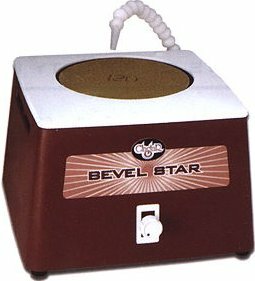 The Bevel Star System (#0140) is a complete beveling station designed for grinding and polishing of straight edges and outside curves. With it you can create, repair, and hand bevel glass projects yourself simply and easily. includes 120 grit Diamond Genesis Pad for roughing, 400 grit Diamond Genesis pad for smoothing, Diamond resin pad for pre-polish and optical quality polyester felt polishing pad with ½ lb. of cerium oxide polishing compound.